The Wizarding World of Harry Potter park forms an extremely popular part of the Island of Adventure theme park at Universal Orlando. Many think it requires a separate admission ticket or that it’s a theme park entirely unto it’s own. Neither is the case. The Harry Potter park can be seen, visited, and experience as part of your normal admission to the Islands of Adventure theme park. In this post, we’ll provide a brief video tour of the island, including the many rides and shops within Hogsmeade Village. Opening in June of 2010, Universal Orlando has experienced great success with the Wizarding World of Harry Potter, even sparking an additional Harry Potter park at Universal Studios Hollywood and rumored expansion of the Orlando Harry Potter park into Universal Studios at the former location of Jaws. 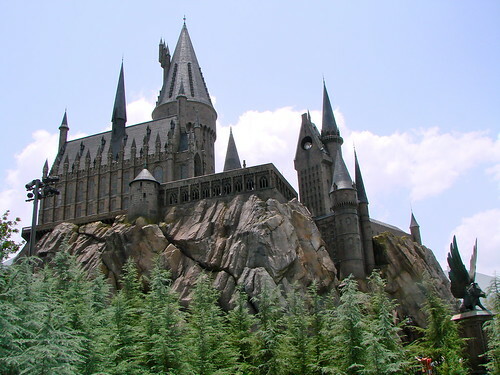 The area’s flagship attraction is Harry Potter and the Forbidden Journey ride which exists within a re-creation of Hogwarts Castle. 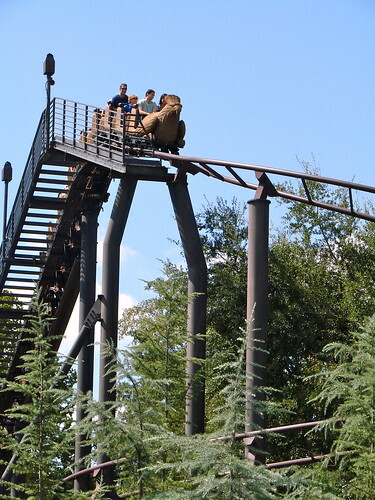 It takes riders on a journey through Harry Potter’s wizarding world with a simulated ride aboard a broomstick with Harry, Hermione, and Ron Weasley. 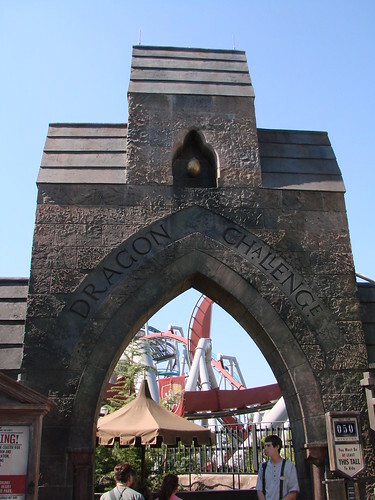 Other attractions include Dragon Challenge, a pair of inverted roller coasters, and Flight of the Hippogriff, a family roller coaster. Other than the main rides, The Wizarding World of Harry Potter is also home to gift shops, restaurants and other tourist attractions. Several of these are re-creations of locations in the Harry Potter books while others have been created specifically for the park. 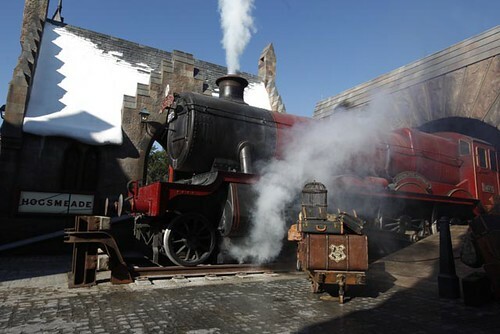 A re-creation of the Hogwarts Express lies at the entry to Hogsmeade. The re-creation features “billowing steam and an iconic whistle” and is accompanied by the conductor of the train. In the Potter series the Hogwarts Express is the train used to transport students from London to Hogwarts. 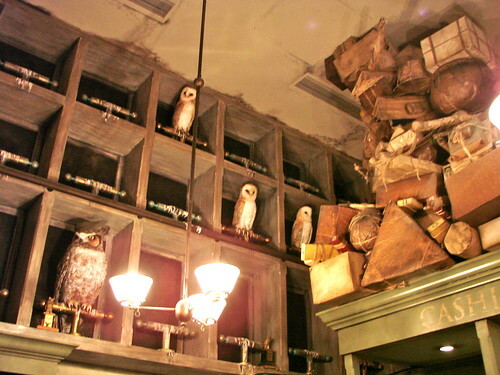 The Owl Post is a working post office (where postcards and letters will be delivered with an authentic Hogsmeade postmark) that also sells stationery, writing implements, stamps, and owl-related gifts. The Three Broomsticks, based on the inn and pub from the Harry Potter books, offers a variety of food and beverage items from the Harry Potter universe including butterbeer, pumpkin juice, strawberry-peanut butter ice cream (as seen in Harry Potter and the Chamber of Secrets), chocolate cauldron cakes in addition to a menu composed of traditional British fare (Shepherd’s pie, fish and chips, etc.). The pub features many hidden references to the book, namely house elves and ghosts that roam the rafters. 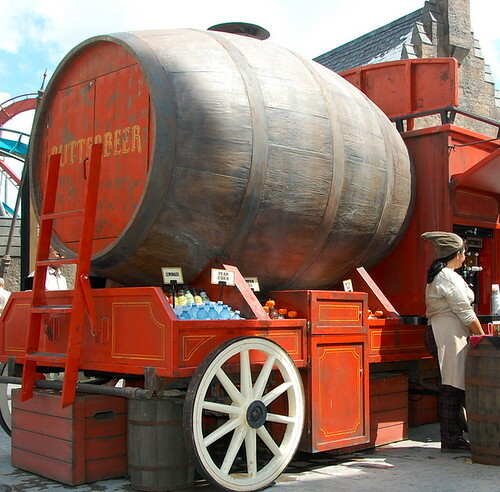 Butterbeer, which can be purchased with a souvenir mug, is offered as a non-alcoholic beverage and comes in both regular and frozen forms, found at the beginning of Hogsmeade fresh off the tap from the butterbeer cart. To me, it tastes like a sweeter version of cream soda. 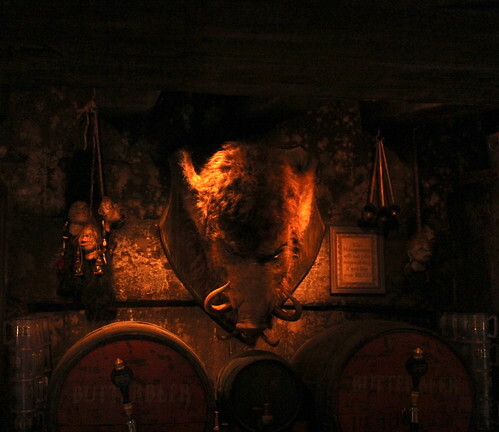 Similarly, The Hog’s Head is based on the pub from the Potter series owned by Aberforth Dumbledore. Honeydukes is a sweet shop, based on Honeydukes Sweetshop in the Harry Potter books. 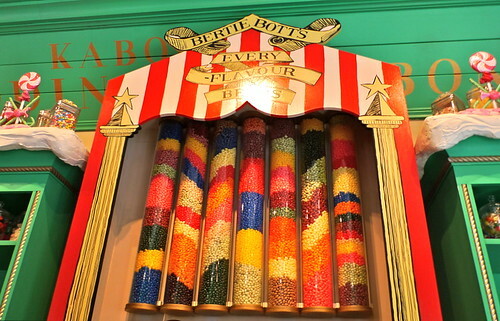 The shop sells many items from the Harry Potter universe including Chocolate Frogs, Acid Pops, exploding bonbons, Cauldron Cakes, treacle fudge, Fizzing Whizzbees, Pepper Imps, and Bertie Bott’s Every-Flavour Beans. 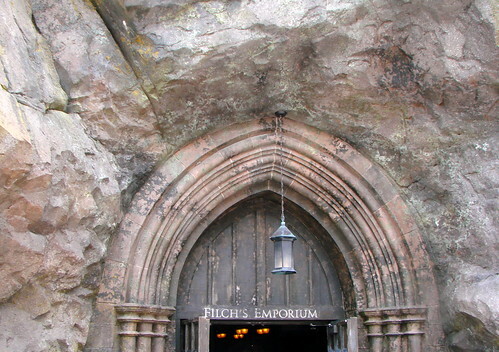 The third shop is Filch’s Emporium of Confiscated Goods. It is a general gift shop (named for Hogwarts caretaker Argus Filch) offering Hogwarts souvenirs (such as clothing and stationery), replicas of props from the Harry Potter films, and other toys and souvenirs. The shop is at the exit to Harry Potter and the Forbidden Journey and is where guests can obtain photos of their ride experience. In the book series, Ollivanders wand shop is located in Diagon Alley, not Hogsmeade; however, the attraction re-created the shop as Ollivanders, portraying it as a branch of the original where Harry purchases his wand in Harry Potter and the Philosopher’s Stone (known in the United States as Harry Potter and the Sorcerer’s Stone). 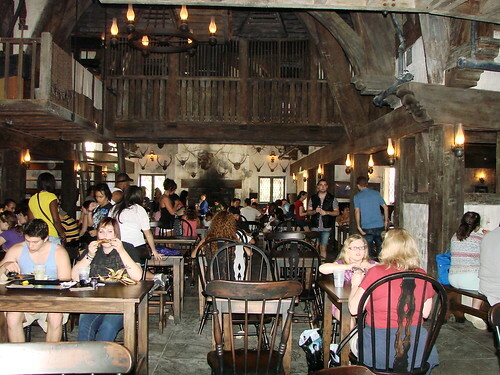 Unlike other shops in the Wizarding World of Harry Potter, visitors are admitted in groups of 20 to experience the premise from the Potter series, that “the wand chooses the wizard”. 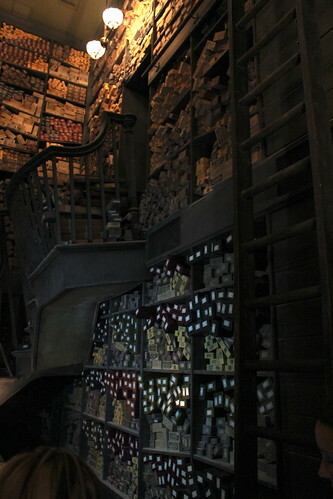 Similar to the first film, the wand keeper and a selected guest test a variety of wands until the right one is found. After experiencing the attraction, souvenir wands can be purchased.